Snow. Pines. Mountain views. Soft light. This was a portion of our checklist as we looked for a winter location for Leslie and Nate. We knew what we were looking for. We needed a flat area with features that would look great in the snow, but that would also let in the right amount of clear light. Leading up to Leslie and Nate’s engagement session we searched high and low driving around and hiking around to scout different areas with Liam strapped to Dallin’s back. When we pulled up to Mueller Park in Bountiful, we knew we had found the perfect place. It checked all the boxes AND it was in the same city that Leslie grew up in – a total bonus! We loved everything about this winter engagement at Mueller Park and the Utah State Capitol. Leslie is a co-owner of Adventure Darling, a jewelry business with everything Disney, Harry Potter, and other fandoms. Jessie has been in love with their jewelry for a while, and we actually had the chance to help them with product photography for their pieces. Seriously, you should check them out! We were so excited when Leslie contacted us about doing their engagements and wedding! Since the first meeting we had with Leslie and Nate we knew we wanted to serve them on their wedding day! These two are an absolute blast! Before they started dating they knew each other for a long enough that they were both in each other’s “friend zone”. After a few attempts by Nate at setting up a first date, it finally happened. They went to The Train Shoppe in Salt Lake for their first date. How awesome is that? After looking that place up and listening to them talk about it, it sounds amazing! We’re definitely going to make a trip there ourselves! Leslie and Nate brought a few cute props to their session that made it special and unique to them. We loved the blanket and mittens that not only looked adorable, but gave them a few minutes of warmth too in the cold Utah winter air! 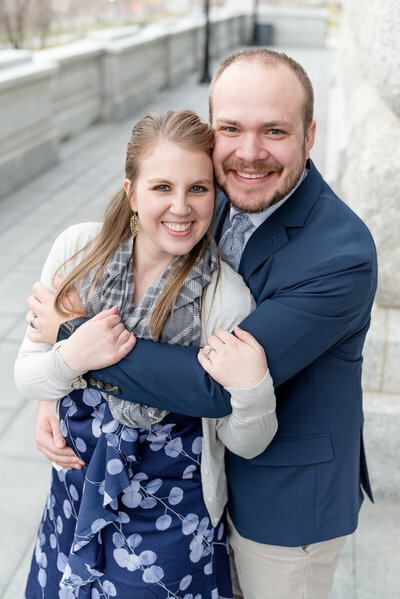 These two had us rolling with laughter from the start and by the time we arrived at the Utah State Capitol Building they had perfected their own version of the “giggle kiss” with something that sounded like it was straight out of the Cone Heads! This Winter Engagement at Mueller Park and the Utah State Capitol will be one that we won’t soon forget! Congratulations AND happy birthday to Leslie and Nate! We can’t wait to serve you both on your wedding day!